Please feel free to print/distribute the above poster, as well as the pamphlet below. “The U.S. Internal Revenue Service is demanding back taxes from Cameco Corp., adding to the miner’s ever-growing tax woes ahead of a crucial trial expected next year. 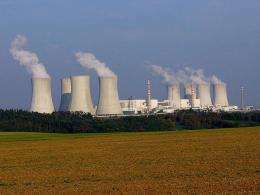 “This week, German Environment Minister Peter Altmaier was interviewed by N24 television, when he said that German nuclear power operators will be forced to bear the estimated $2.6 billion dollar costs of dealing with the nuclear waste they created. “The cost of dealing with nuclear waste will be borne by those who produced it,” Altmaier said. In Saskatchewan where physicians have been advocating for a base-line health study for decades without success we are facing the same soaring increases in cancer and non-HIV AIDS, like lupus. Both the government and the uranium industry have known of the health impacts since the 50’s yet, they continue to increase uranium production at an increasingly heavy cost to aboriginal people. They studied the miners who they used to get the uranium but they refuse to study the local populations who are also getting sick and dying claiming that the populations are too small to get any definitive result. How can that be true if the number of miners studied was an even smaller number? “It ended, with no apparent sense of irony, on April Fools’ Day. Obama’s much-heralded ‘Nuclear Security Summit’ came to a close on April 1st in Washington, D.C., having drawn representatives from about 50 countries…minus Russia, which declined to attend citing a “shortage of mutual cooperation” and the exclusion of some of its allies from the invitation list.